"Design an app for builders and clients to organize and track the budget of a construction project." This is a freelance project that I completed the User Experience/User Interface mobile app design for. The premise is to track, understand, and communicate about the budget for a construction project. Chipi.Works aims to incorporate business procedures into the everyday experience of the construction process. 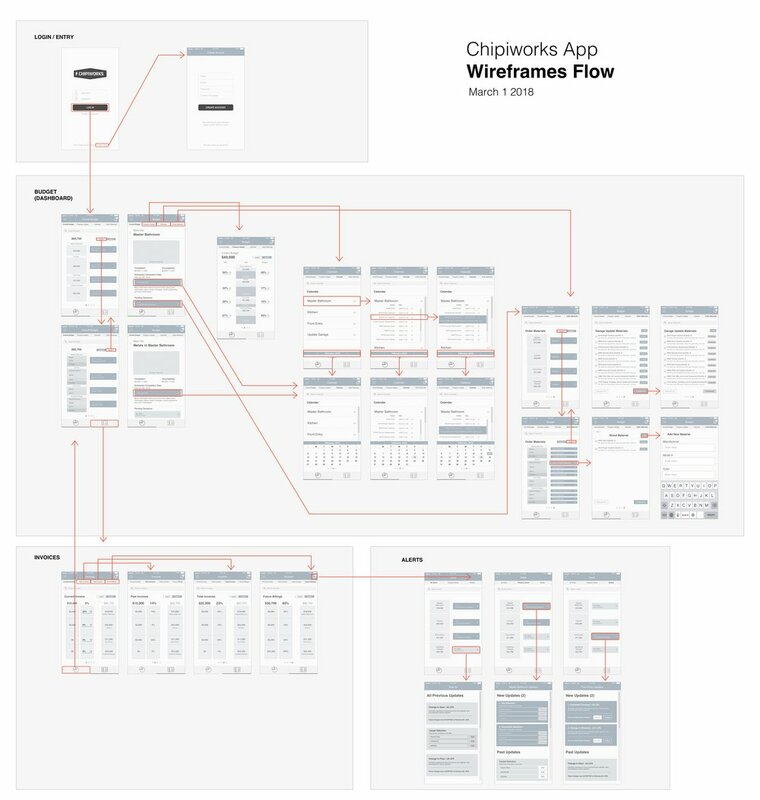 After taking a look at what other apps are doing in the space, we determined the app’s architecture and flow, and then moved into wireframing and prototyping. I designed the app with a mobile-first approach; I’m currently working on the desktop version for when Chipi.Works starts doing business. After researching available and popular apps in this arena, I found many construction apps that aid builders and project owners in determining spaces, proper practices, and architectural procedures. There was not much in terms of budgeting and communicating about material needs, updates, and availability. I began with simple sketches of the app screens and moved into wireframing in the Sketch App. After constructing a wireframe prototype in Invision, I spoke with contractors, builders, and property owners through my client’s network. After getting their feedback, I created a more finalized version of the app and incorporated visual design. I worked on the branding for Chipi.Works during this time as well. I've received feedback from the client concerning this visual design UI prototype, and will be bringing the designs from mobile to a desktop version as well. Check back soon to see updates!